Social media can be used as a tool for boosting up the online market. With the user range of above 800 million around the world, Facebook has turned out to be one of the major social media platforms. With the help of this module, the store owner can easily integrate Facebook Messenger to the Opencart store. This will help the admin built a good customer relationship as the module will allow the conversation between the buyers and the store owner. This will boost the customer experience as well as the commitment and loyalty of the customer towards the store. Send images, documents, file attachments and emojis in messages. Installation of Opencart Facebook Messenger Chat is easy. In the fb_messenger_chat.ocmod.zip file, the admin will find two folders, namely admin and catalog. The admin needs to upload admin and catalog folders to the root directory of the website. The admin can also install the Opencart Facebook Messenger Chat module by uploading the facebook.zip file through Extension>Extension Installer. After the upload is completed, the admin can log in and go to Extensions > Modification and click on refresh field. After that in Admin panel go to System> Users> Usergroup and edit ‘Administrator’ and select all for both Access and Modify Permission then save it. After that under Extension > Modules install the Opencart Facebook Messenger Chat Module as shown in the image below. After installing the module, the admin can configure the module by clicking on the edit button. The module configuration page will appear as shown in the image below. The admin can set the status as enable/disable the module. The admin can also configure the following options under the Facebook Messenger Chat as shown in the image below. 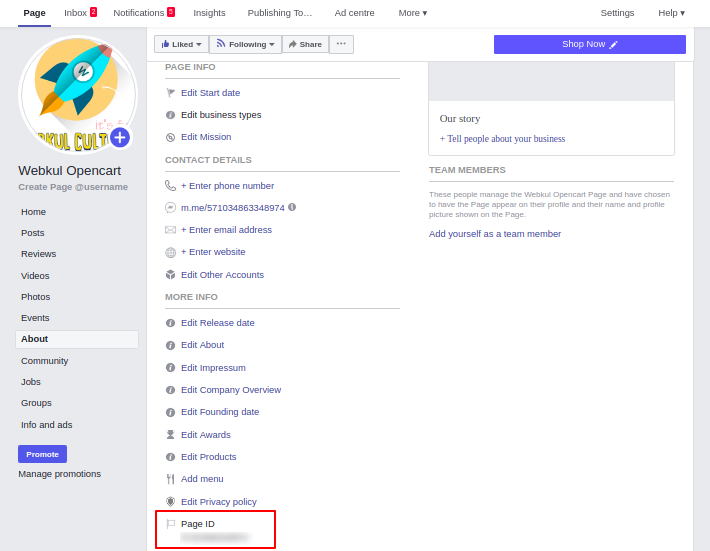 Facebook Page ID: The admin needs to enter the page ID of the page that the admin wants to integrate with the Opencart store. The admin needs to log in to Facebook Account, then the admin can create a new page or can select any existing page by navigating to Pages. Under the Your Pages section, select the page whose Page ID admin needs to get. 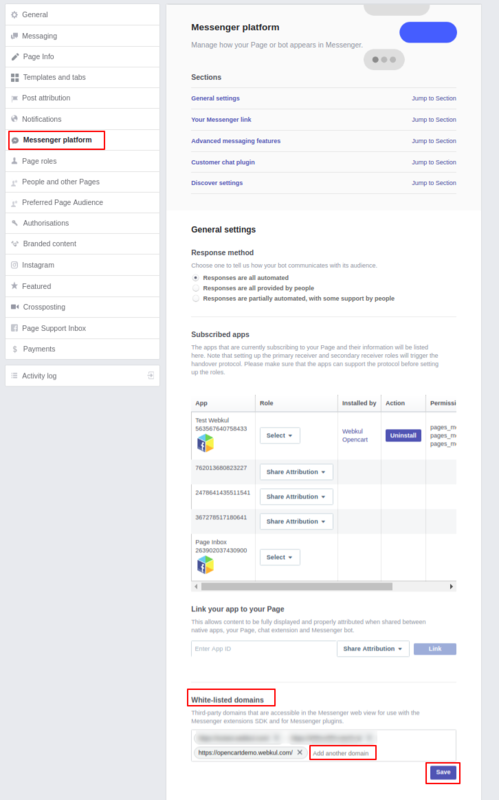 After selecting the required page, the admin will have to navigate to the About section of the facebook page. In the More Info column, the admin can get the Page ID. Messenger Theme Color: The admin can change Color by selecting any of the colors from the color box tool as shown in the image below. Welcome Message: The admin can set the welcome message which will be displayed to the customer, once the customer access the website. Log Out Message: The admin can set the custom message which will be displayed to the customer when the user is not logged in to the website. Messenger Display Delay: This section will allow admin to set the time after which the messenger will be displayed on the screen. If the delay time is set as 0, then the messenger will be displayed instantly as the page will load. The time set in this section will be in seconds. The maximum delay which the admin can set is 120. If the admin wants to integrate the facebook to their opencart store then the admin will have to add the domain of the Opencart Store to the Facebook page. Note: This module will allow admin to add multiple domains, so multiple stores can be added with the help of this module. On the Facebook Page, the admin needs to navigate to the setting section of the pages as shown in the image below. On the setting page in the Left Navigation Drawer, the admin needs to select the Messenger Platform as shown in the image below. Under the General Setting section in the White-listed domain, the admin can add the multiple domains on which the messenger needs to be activated. After the module gets configured, the messenger icon will be displayed on the front end as shown in the image below. On clicking on the log into messenger, the pop-up box will appear in which the admin needs to enter the login credentials as shown in the image below. After the customer is logged in, the customer can communicate with the store owner as shown in the image below. The customer can even send attachments(documents, and images, etc) and emoji along with the text content over the chat as shown in the image below. On clicking the I section, the customer will be able to see the following section as shown in the image below. Turn On/Off Message: The customer can turn off the messages which will not allow the messages to be transacted. Mute Conversation: If muted will allow the customer to keep getting distracted via chat. The customer will not be notified when the conversation is muted. View On Messenger: The customer will be navigated to the messenger by selecting the following option. If the customer has messenger installed in the device, the below image shows the mobile view of the messenger app when view on messenger button is clicked. Visit Facebook Page: On selecting the Visit Facebook page, the customer will be navigated to the admin’s created facebook page whose Page ID is added by the admin in the backend. Add Messenger To Your Website: On the clicking on the add messenger to the Opencart website, the customer will be navigated to the Add Messenger To Website page. The store owner can view all the conversation in the inbox section of the Facebook page. The messages will be displayed in the inbox section as shown in the image below. The Store owner will be notified through the facebook notifications sent by the customer over Facebook. If you have any sort of query or questions, please feel free to revert us at support@webkul.com.